How to time a €100 million short in Renault? UK fund, Merian Global Investors, placed an about €100 million short bet (0.51%) against Renault on 2018-30-10, making a multi-million profit from the drop in Renault's shares after its CEO was arrested. See also Business Insider's article that refers to our data and analytics. This is currently the only short >0.5% ("big short") in Renault and is the first big short in Renault since almost four years. The previous big short has been a short by a well-known french fund Carmignac Gestion and was in place from Nov'14 until Feb'15 (red area on the Renault's chart). When it comes to car makers and short selling, stories about Tesla and short sellers often pop up, but there is much more going on lately. In fact, several EU car makers are in focus of short sellers. Recently a short bet by Soros against Aston Martin popped up, while a long-term big short in Peugeot is being held by Lansdowne Partners for more than 2 years (latest short position size: 0.88%). 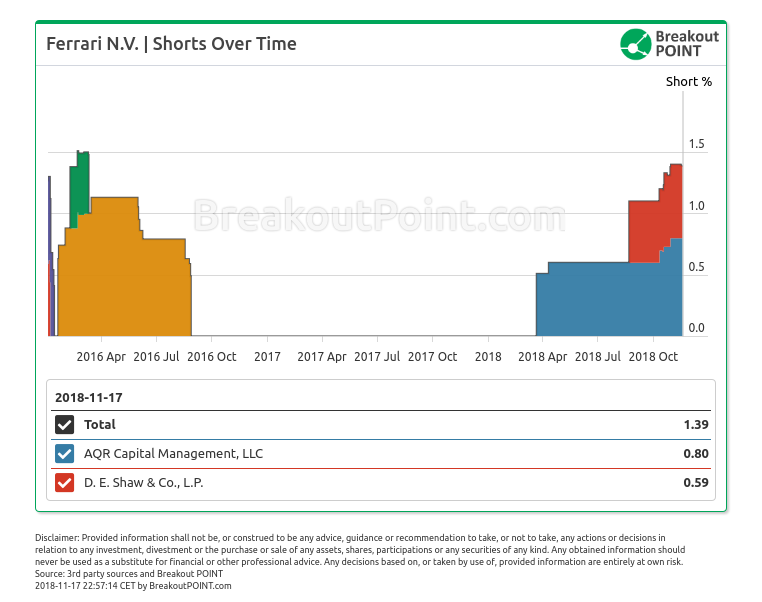 Two famous quant funds currently hold a big short in Ferrari: AQR Capital 0.8% and D.E. Shaw 0.59%. Both of these Ferrari shorts emerged in 2018. 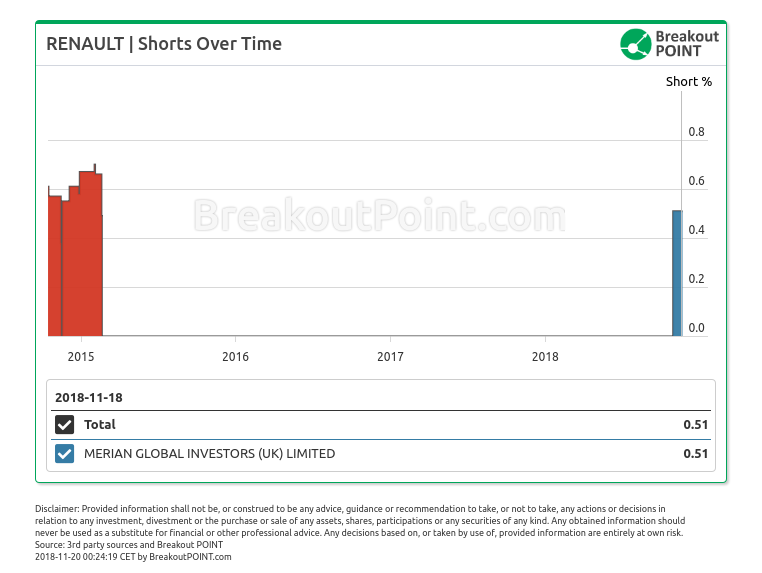 According to Breakout Point's records, Merian holds 53 big shorts across EU, while they were holding about 30 such positions a year ago, indicating that they might have been well prepared for the recent market losses. They are 5th largest hedge fund when it comes to the number of big short positions. Interestingly, they hold two big shorts In Auto & Auto Parts sectors. Both of these short positions are in French companies: Valeo (1.5%) and Renault (0.51%).